Despite what the Malaysian Information Minister, his name is Rais, if i'm right, once said about the dangers of the online world and Facebook, i'm guessing that our dear friends from the police department were not really paying attention during that time when they decided to launch their official Facebook page recently. On top of that, the Royal Malaysian Police (PDRM) decided that not only they are going to ignore the advice from our Information Minister, they are gonna get a Facebook page for themselves too! And in the meantime, throw in an additional RM 200 000 to make their Facebook page real nice. You heard me right, or at least seen the news report right, the PDRM are gonna spend RM 200 000 for their new media center, which happens to be "equipped with high speed broadband computers for quick access to the Internet and response to queries" only. Isn't RM 200 000 for a few computers and broadband internet connections a little too much? What computer would they be getting anyway? A super-dang-powerful-computers that Superman uses for RM 10 000 each? What about the internet packages? Ask internet providers from either Singapore or Thailand to provide internet access for perhaps RM 10 000 per month since the internet speed of Malaysia can't make it? And why do you even need a super high speed internet connection in the first place? What kind of queries that you hope to answer through Facebook using a 4.0 Mbps (one of the fastest speed you can get in Malaysia) connection? Like how my friend put the calculation aptly, "Facebook = free. 50 laptops at RM3000 each = RM15000. TMNuts Screamyx 4.0Mbps for each laptop at RM268 = RM13400. Total = RM43400." And media center? What kind of media center are you talking about? The one which has satellite broadcasting dishes like the television companies, or just one room with just a few computers with internet connection? Maybe i'm wrong. 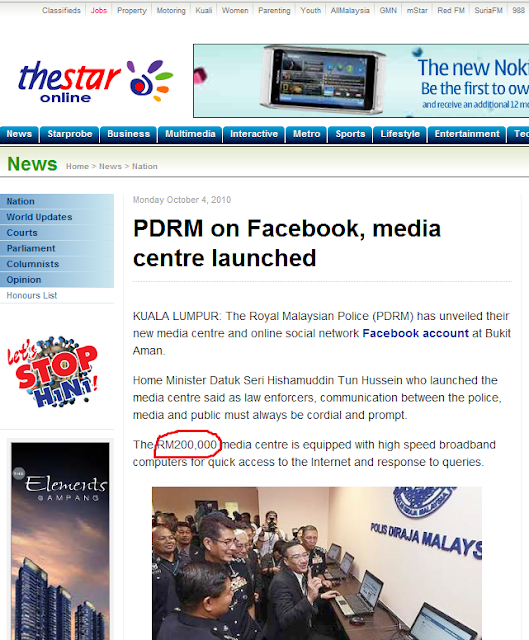 Maybe the PDRM did spend RM 200 000 on the new media center. Who knows? They might have needed to build an entire new building equipped with air conditioners and comfortable sofas so the police officers in charge of the Facebook account can browse through the web and answer the public queries in Facebook with a relaxed mind. Maybe throw in a coffee machine at the same time to keep the officers alert. I'm not condemning the PDRM's effort to try and keep up with the ever changing society. The effort is commendable. In fact, i'm pretty sure that their Facebook page will in fact be very effective, judging by how many complaints the public have against Malaysian police. The problem is that the entire thing smelled quite fishy. Surely we wouldn't want the incident during one of the last auditor's general report to happen again. The case where a pen costs a few hundred dollars and a broom costs a few thousand dollars? Perhaps the PDRM could come clean and tell us, the public, what they bought for the media center that could total up to RM 200 000. And why they need to spend so much money and effort just for Facebook purposes.